Oh, we got a good one for you today… I’m sure everyone here has eaten, or at least heard of Falafel and Shawarma. 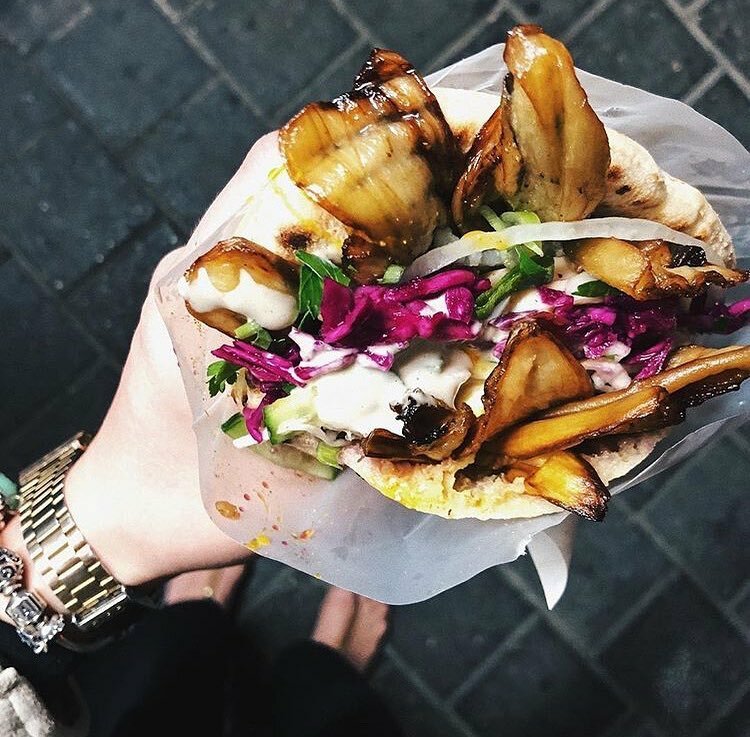 But Sabich is Israel’s well-kept street food secret. During my time living in the Middle East, I was always partial to Sabich. Too many bad experiences with subpar Falafel, and as it pertains to the Shawarma, I prefer its Turkish and Greek cousins – the Döner Kebab and the Gyro. The Sabich is exactly the type of vegetarian sandwich that won’t let you long for any animal protein. A pita, filled to the brim with deep-fried eggplant, hummus, tahini, Israeli salad, cabbage, hard-boiled eggs and amba. If you don’t know what some of these things are, don’t worry, I’ll get to it in a minute. First however, I’d like to delve into the dish’s history a little bit. I later learned that although creative, this was incorrect. The dish first entered the public consciousness in Israel, with the arrival of Iraqi Jews in the 1940s and 1950s. In Iraq, Jewish families would eat Sabich for breakfast on Saturdays, the Jewish sabbath (Shabbat). Since Jews are not allowed to cook on their day of rest, the Sabich was an easy and nutritious way to start the day. All the ingredients could be prepared a day in advance. 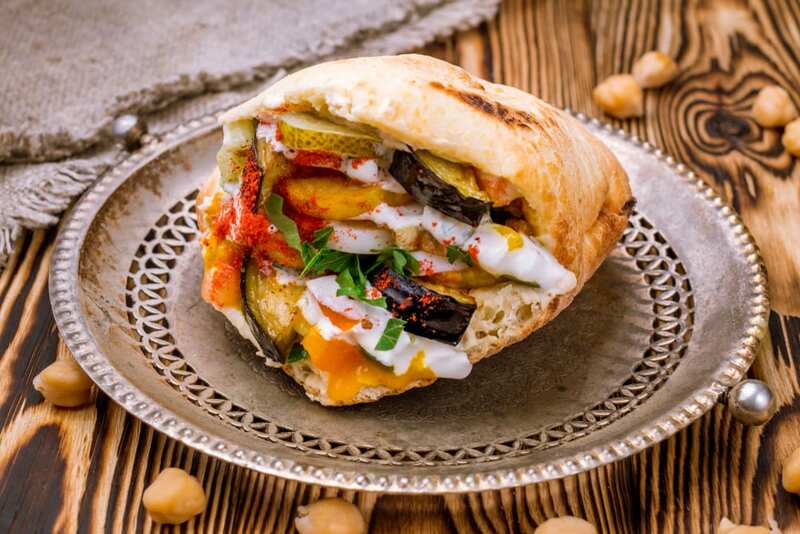 It is therefore widely believed, that the word Sabich, remember a breakfast food, comes from the Arabic word Sabach (صباح), which translates to morning. Others believe that the food is named for the first food stall owner in Israel selling Sabich – Sabich Tsvi Halabi. The only other mystery we should clear up before starting with the recipe is the question of the condiments. 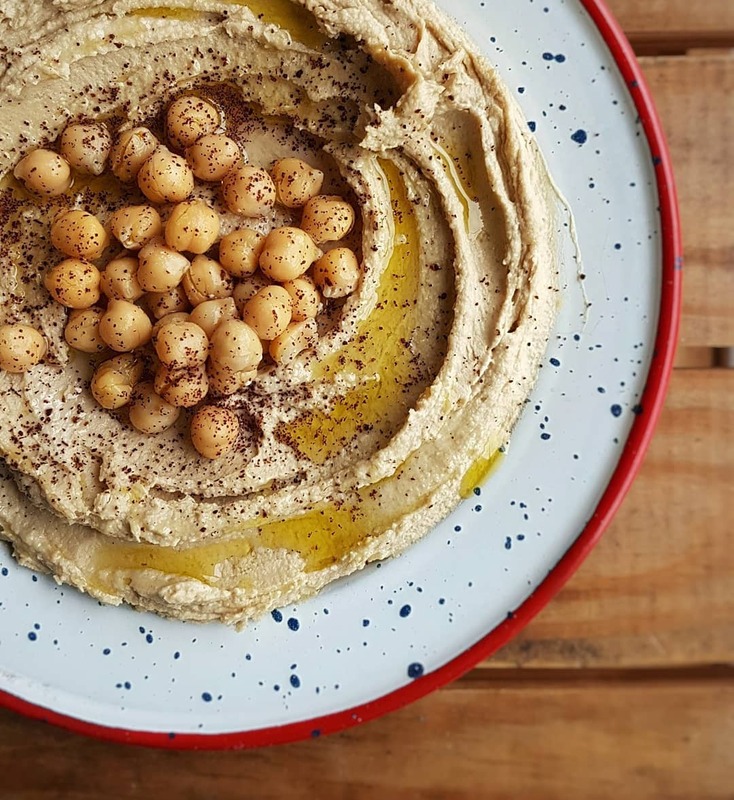 While hummus and tahini are fairly common these days, amba might be unfamiliar to most. Amba is a pickled mango condiment, reminiscent of savoury South Asian chutneys. If you are unable to get your hands on amba, you can either use your mango chutney of choice, or get a mango chutney and blitz in your food processor with some Israeli pickles. A lot of people also add a drizzle of schug, a yemenite hot sauce that comes in green and red varieties, to their Sabich. Even though there is so much going on in this sandwich, the eggplant is the star of the Sabich. Traditionally deep-fried, I can understand that for your Meatless Monday you’d like to eat as healthy as possible. Therefore, I’ve also included an oven-roasted eggplant alternative. There are, however, some key differences in prepping the eggplant. We’re often told, that we should heavily salt the eggplant for at least half an hour to extract some of the moisture and bitterness within. While I would still recommend that for the oven-roasted method (don’t forget to wash off the salt before actually roasting! ), it is unnecessary if you are deep-frying. The first thing you need to do is decide, how you want your eggplant prepared. Deep-fried method: If you deep-fry, it is your choice how you want to cut your eggplant. If you are somebody who likes to layer a sandwich neatly, I’d recommend cutting it into even rounds (a quarter inch thick). If you are more prone to stuff the pita, I find quartering the eggplant length-wise and then cutting across (quarter inch thick), creating quarter pieces, quite satisfying. Oven-roasted method: Preheat your oven to 220°C (450°F). In the meantime cut your eggplant into quarter-inch thick rounds and salt them heavily. 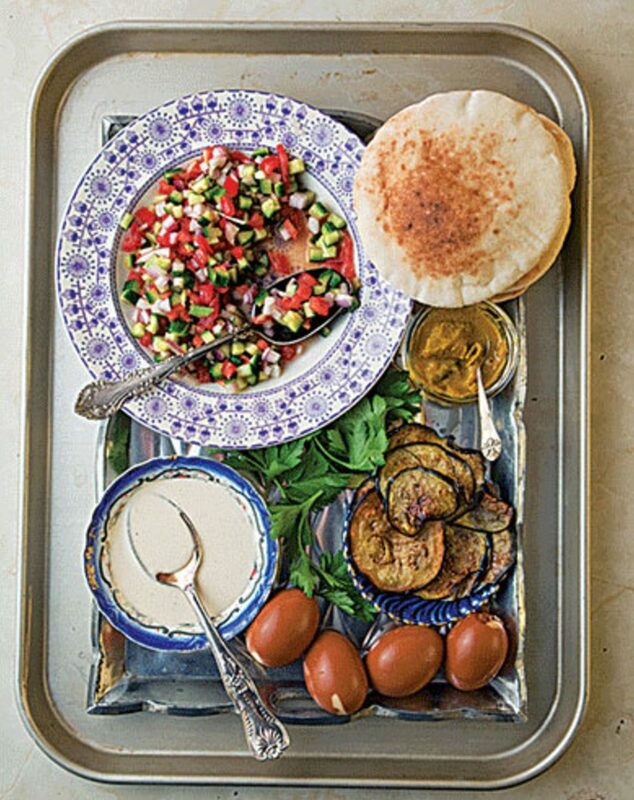 While the eggplant is dehydrating for half an hour, mix together a cup of olive oil, the za’atar and 4 cloves of crushed garlic. Wash off the salt from the eggplant, dry with paper towel, and line up the rounds on a wire rack inside of a rimmed baking sheet. Brush both sides of the eggplant rounds with the olive oil mixture. Roast for 40 minutes. You might need to do this in two batches. In this recipe jump step 6. Dice your tomatoes and cucumber, and toss with olive oil, salt and lemon juice to taste (juice of about half a lemon). Set aside. Combine half a cup of tahini paste, the juice of two lemons, cumin, salt, and some cold water (start with 4 tablespoons) in a bowl. Mix until it becomes the consistency of thin yogurt. If it is too thick, keep adding water – a tablespoon at a time. Season to taste with more salt or lemon juice. Set aside. Slice your cabbage thinly, and toss it with some olive oil and the white wine vinegar. Set aside. Boil the eggs for 12 minutes. Transfer to a bowl with ice water and let them cool off. Let’s get to frying. Heat about a quarter inch of vegetable oil (I use canola) in a large skillet. When the oil gets shimmery you should be ready. Lower the eggplant into the oil in batches – don’t crowd the skillet. Lower the heat if the oil starts to smoke at any point. The eggplant should only take about 4 minutes at a time. Rotate once after 2 minutes. Once a batch is done, transfer into a bowl and hit it with a pinch of salt. Then transfer to a paper towel-lined plate or baking sheet. Once the eggplant has cooled down a bit, toss back into a bowl, add a splash of olive oil and a half cup of minced parsley. Mix thoroughly. We are ready to assemble. The following is only a suggestion, so do as you please. If your pita is dry or frozen, here’s a quick tip: microwave one pita at a time for 10-20 sec. Then toast for one minute. Tear open the pita at the top, creating enough space to fill the whole pocket. Schmear about 2 tablespoons of hummus into the pocket in an even layer. Fill the rest with some pieces of eggplant, a spoonful of Israeli salad, some cabbage, 3-4 slices of egg, and some pickles. Drizzle generously with tahini and amba. ENJOY! Drain the can of chickpeas and rinse the beautiful legumes. Add all the ingredients except paprika into a food processor and pulse until a smooth consistency is achieved. If the mixture is too thick, add more olive oil. Season to taste with paprika and more salt, if needed. Kevin Sachs was born and raised in Zurich, Switzerland. 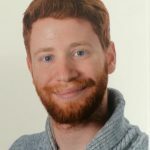 As a former broadcast journalist for SRF, his previous works were featured in Haaretz, Le Matin, Tagesanzeiger, Süddeutsche Zeitung and AWE Magazine. With his passion for all things food and travel, it was only a matter of time until he ended up at DINE Magazine.